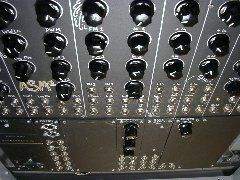 Figured I'd give you a brief presentation of my DIY modular analog synth. 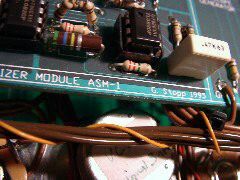 The basis of it is the Gene Stopp designed ASM-1 board, which I purchased from him in... must have been 1998 or thereabouts. 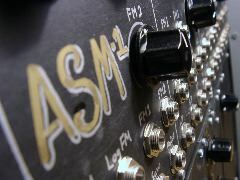 The ASM-1 makes up all the top-row modules, from left to right: two VCOs, VCF, two VCAs, two ADSR EGs, and the last one is LFO and Glide and noise. 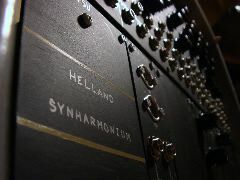 The bottom row of modules are (from left to right again): the power supply (based on a very nice Power One PSU), a patch panel (with power outlets at the top), a poorly made triple LFO, a double ring modulator of Juergen Haible design, and a spring reverb from an old Solina organ supported by a circuit based on a tech note by Roy Mallory. The form factor is based more or less on the MOTM style which I like very much. Panels are made (with crude tools) of aluminum, and spray painted black before they are "decorated" with a silver marker. Works OK. Cheap.